ActioNet, Inc. presented a check for $750 to Pearl City High School’s (PCHS) Robotics Program on May 22, 2014. This is the third year ActioNet is a sponsor of PCHS’ Robotics Program. PCHS’ VEX and FIRST Robotic Competition (FRC) programs competed very well in the 2013-2014 school year. The VEX team won multiple awards at several tournaments and won the Design Award at the Hawaii State VEX Championship. The FRC team was in the Quarter Finals during the Hawaii Regional competition. In addition to competing in the VEX and the FRC Robotic programs, Pearl City High School began their first mentorship program with the Lehua Summer Robotics Academy in summer 2013. They worked with children from six different elementary schools in the school district for one week before their Exhibition Playoffs on July 11, 2013 in the Lehua Elementary Cafeteria. The Lehua Summer Academy had a class structure through which the students progress as they learn more about robotics. Through these class stages the students learned about basic electronics, programming and building. As the weeks progressed they built, tested, and even programmed their own robots to compete at their Exhibition Playoffs. The Exhibition Playoffs was a fun day for everyone involved, from the competitions to the slideshow and the refreshments. One of the reasons for starting a robotics program at the elementary level was to become a “hub of robotics” for students, with programs starting from elementary school level and continuing to the high school level. Robotics provides a solid foundation for students interested in pursuing engineering. Pearl City High School plans to host Lehua Summer Academy again in summer 2014. 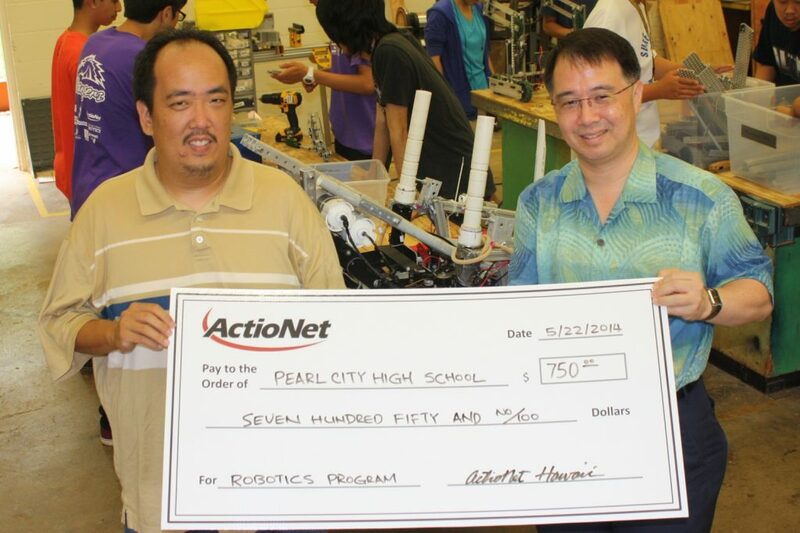 ActioNet, Inc. is proud to be a continuous sponsor of the Pearl City High School Robotics Team.